Our amazing Chief Operating Officer, Anne Lee, will be transitioning out of her role to pursue a new adventure. 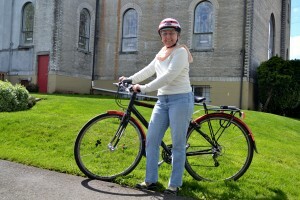 After five years at the Community Cycling Center, she made an incredible contribution to our organization. Anne shared with us what her time here has meant to her. I remember driving across the country five years ago on my way to my new home in Portland, Oregon. As I rounded a bend on that sunny July day after six days on the road, Mount Hood came into sight and took my breath away. The past five years of working at the Community Cycling Center are as stunning in my memory as that first sight of Mount Hood. I will be forever grateful for the opportunity to work at this amazing organization and am confident that the Community Cycling Center will continue to thrive and grow long after my departure. Donors, volunteers, staff, and community members connected with this organization provide enormous support for our work. Our gratitude pales in comparison to the value of their time and financial contributions. I hope all of you will continue to invest in this amazing organization. My adventures take me in a new direction. In addition to a new job, I am directing some of my efforts into advocating for biking and walking in Washington County, which is where I have made my home for the past five years. Hopefully our paths will cross many times as we work to make the roads safer for bike riders and pedestrians. I will miss everyone, of course, but most of all, I will miss working with the staff. This is a group of creative and talented people with a passion for bicycles and the change they bring to peoples’ lives. I could not have wished for a more passionate and dedicated crew of co-workers. Thank you for everything.